Authorities say a small plane with three people aboard has crashed in the mountains of eastern Tennessee, and no one survived. A reconnaissance flight by the Tennessee Army National Guard found the plane inside the Great Smoky Mountains National Park at around 4:45 p.m. Tuesday. A release from the National Park Service says the three on the plane were 41-year-old David Starling, 42-year-old Kim Smith and 8-year-old Hunter Starling, all from Bradford County, Florida. The Cessna 182 aircraft was in route to the Gatlinburg-Pigeon Forge Airport on Monday when it disappeared. The Federal Aviation Administration says a family member contacted the agency when the flight didn't arrive as expected. The victims will be recovered from the crash site on Wednesday and their identities need to be confirmed. David Starling, his son, Hunter Starling, and girlfriend Kim Smith, were reported missing Monday on a plane traveling from Jacksonville, Florida to the Gatlinburg- Pigeon Forge Airport in Sevier County. The plane wreckage was found Tuesday afternoon. There were no survivors on board. GATLINBURG , Tenn., Dec. 28 (UPI) -- Searchers recovered the bodies of three people from the crash of a small plane in Tennessee's Great Smoky Mountains National Park, the National Park Service confirmed. The plane left Jacksonville, Fla. on Monday and crashed as it approached its destination, Gatlinburg-Pigeon Forge Airport, near Knoxville, Tenn., the park service said. Air traffic controllers lost touch with the plane at around 4 p.m. Monday. A reconnaissance flight by the Tennessee Air National Guard located the single-engine Cessna 182H plane late Tuesday afternoon. On board were David Starling, 41; his son Hunter, 8, and Kim Smith, 42, all from the Jacksonville area. The three were traveling to Gatlinburg for a vacation with Smith's relatives, the woman's cousin, Samantha Hodges, said. Paramedics were lowered to the plane from a military helicopter and confirmed there were no survivors. The park service statement did not mention the cause of the crash, but said the plane was found between Cole Creek and Bearpen Hollow Branch in the national park. A land-based search for the plane was slowed by the terrain. Molly Schoer, Great Smoky Mountains National Park information officer, said the plane was found in "a very steep area, hard to get to by foot." The National Transportation Safety Board will investigate the incident. The National Park Service, Air Force Rescue Coordination Center, Civil Air Patrol, Federal Aviation Administration and the Tennessee Emergency Management Agency were all involved in the search. KNOXVILLE, Tenn. — Three people are dead after a plane crash in Great Smoky Mountains National Park, according to the National Park Service, which confirmed Tuesday night that a single-engine plane headed to the Gatlinburg-Pigeon Forge Airport had been found and that there were no survivors. 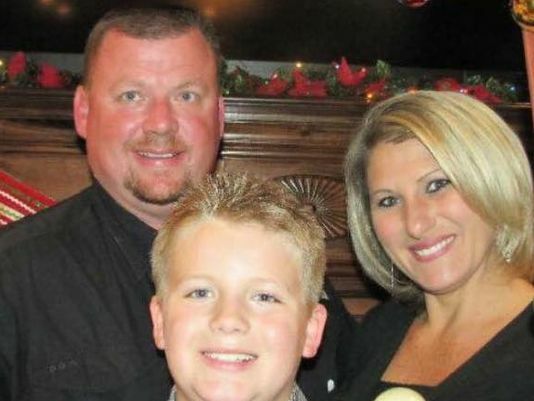 Kim Smith, of High Springs, Fla.; her boyfriend, David Starling; and Starling's 8-year-old son, Hunter Starling, were aboard the plane, according to Samantha Hodges, of Jasper, Fla., Smith's second cousin, who said Tuesday afternoon that the family had not heard from them. A news release from the National Park Service said the three were on board the plane and that there were no survivors of the crash, but also said "the identities of the victims have not been confirmed." The trio was traveling to the Gatlinburg area for a vacation with members of Smith's family who already were there, including her mother and sister, according to Hodges. The National Park Service initially received a report about 7:35 p.m. Monday that the plane may have gone down in the central area of the park. Tuesday's release offered no details about the cause of the crash but said the National Transportation Safety Board will lead an investigation. A reconnaissance flight by the Tennessee Army National Guard was able to locate the missing plane within Great Smoky Mountains National Park at approximately 4:43 p.m. Tuesday, according to the release. The plane was found on an unnamed ridge between Cole Creek and Bearpen Hollow Branch. Paramedics on board were hoisted down to the crash site and confirmed that there were no survivors. Kathleen Bergen, a Federal Aviation Administration spokeswoman, said the plane was a Cessna 182 that took off from a Jacksonville, Fla.-area airport. It was bound for the Gatlinburg-Pigeon Forge Airport, according to the park service. Ground search teams were deployed Tuesday to Bearpen Hollow Branch and areas southwest of the Bullhead Trail to search for signs of the aircraft, but were unable to access some areas due to the rough terrain. A single Blackhawk helicopter was able to fly late afternoon and spotted the wreckage along the last known flight path of the missing aircraft. Recovery efforts of the three victims will begin Wednesday, the release from the park service said. Hodges said the private plane belonged to David Starling. Records from the Federal Aviation Administration show a Cessna 182H registered to Joseph David Starling of Lawtey, Fla. A search for David Starling turned up no records, but the FAA did have an airman's certificate on file for Joseph David Starling showing he was certified in April 2014 as a private pilot. Members of Smith's family last had contact with the three around 4 p.m. Monday, Hodges said, when Smith told her mother over the phone that they were about 13 minutes away. "They were waiting on them, but they never landed," Hodges said. 0 Response to "Authorities: 3 killed in Tennessee plane crash"